"Civitavecchia Rome trains are very nice and modern, safe and air-conditioned..."
When your Mediterranean cruise ship docks in Civitavecchia Italy, you will need a well planned way of getting from Civitavecchia to Rome. Unfortunately, visiting Rome from a cruise ship isn’t one of those days when you simply walk off the ship and everything is right there for you… your getting from the port of Civitavecchia to the city of Rome will entail a little bit of travelling. 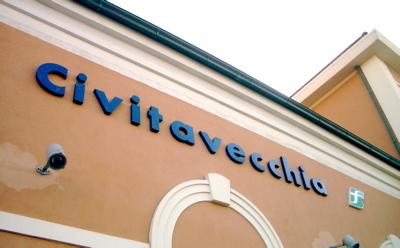 How do we take the Civitavecchia Rome Train? Taking a Civitavecchia Rome train is the most cost effective one. Before you even start planning your transportation from Civitavecchia to Rome, please read our article on the port of Civitavecchia, it will show you a step-by-step process of how to get from the cruise dock to the exit of the port area. Now we can talk about the train from Civitavecchia to Rome! Once you find yourself at the railway station, which is only 10 mins. away from the port exit, buy a BIRG ticket for approx. 9 euros per person. 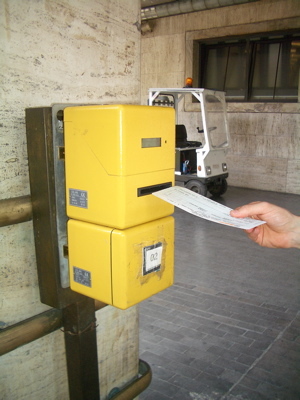 This is a return ticket, which is also valid for the local buses and the metro once in Rome. It’s always good to know the exact time of train departures and we suggest you pick yours ahead by looking at the timetables at the official Trenitalia site. 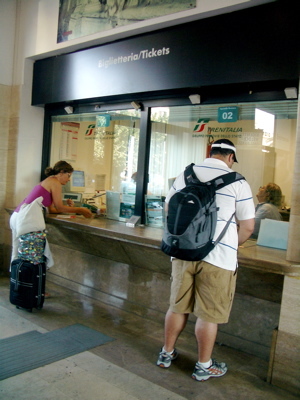 For your Civitavecchia Rome train departure station you will punch in Civitavecchia and for the arrival station Roma San Pietro. Trains leave at least twice an hour but still, when you’re on such a limited schedule, it’s good not to waste any time at all. Still, if you happen to have some extra time, start your day Italian style: grab a really nice espresso standing at the café bar. Don’t forget a cornetto (a pastry which is the Italian version of a croissant). Before you board the train make sure you validate your ticket in one of the yellow boxes in the train station building. Once you get on the train you won't be able to do that and you could be fined if caught! There are two major train stations in Rome: Roma San Pietro and Roma Termini. We suggest you get off your Civitavecchia Rome train at Roma San Pietro, which is only 5 minutes away from the Vatican and the Basilica of St. Peter’s. From there, it’s very easy to walk into the city, which is just across the Tiber river. Unlike the trains from Naples to Pompeii, Civitavecchia Rome trains are very nice and modern, safe and air-conditioned. There are even toilets available (unfortunately not the cleanest though!). With the length of the ride being just under an hour, you will find yourself off that Civitavecchia Rome train in a heartbeat! Next, walk out of a really small train station building (no kilometres of confusing corridors) and walk out to the main road. You will find yourself in a peaceful and quiet part of Rome, with the cupola of St. Peter’s Basilica looming behind the rooftops. Perfect! You’re almost there. With the train station behind you, take a left, then a right, follow the road, go through the underpass and voila… you will find yourself in the middle of the Vatican city… just like that! As Vatican city is one of the things you will be seeing in Rome, find out all about Vatican's Hidden Corners and Courtyards in this article by Mary Jane Cryan, the famous writer, historian and luxury cruise ship lecturer. From there, it’s very easy to walk to see all the other Rome attractions and you can read about that in our article Rome sightseeing. Also, check out our Rome Italy map to see the route from the train station to St Peter’s square!